In 2015, Saturday Night Live aired an episode with Miley Cyrus as the host and musical guest. The episode featured a skit that poked fun at millennials. The audiences didn’t know quite what to make of it. Some chuckled in approval while others called it a gross exaggeration. Whatever the opinion, the skit highlighted two important points: a) millennials are a coveted and important demographic, and b) they are tech savvy. In today’s dynamic business world, industries across the board are making technological advances. In fact, many strategists believe that if a company does not have a ‘learning attitude’, it risks being left behind. Research also indicates that employee training is a worthwhile investment. Training and development initiatives are an integral part of implementing the ‘learning culture’. Training expenditures have increased by an average of 13% over the past few years, signifying a growing importance for training provided by companies. This increase also could be partly driven by the expectations of younger employees joining the organization. A Price Waterhouse Coopers report shows that millennials share three distinct characteristics: they are ambitious, constantly learning, and want to progress rapidly. It is also estimated that by 2020, around 50% of the employed populace will consist of millennials. That’s why organizations must develop and deliver training that resonates with their millennial employees in order to sustain talent. 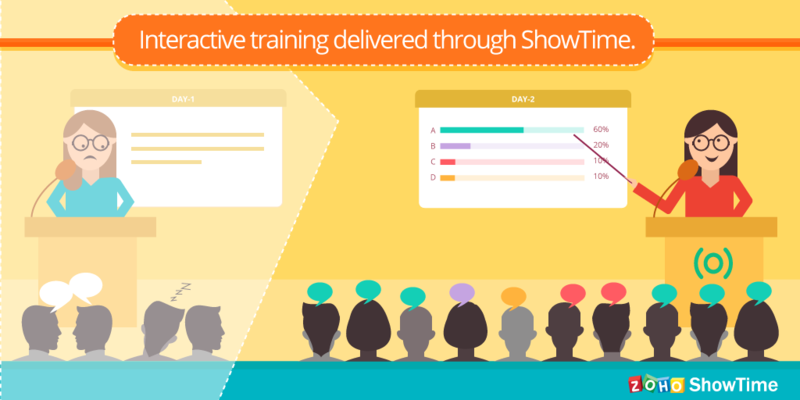 Zoho ShowTime lets the trainer connect with millennials thanks to a set of appealing features. ShowTime’s mobile apps – the Presenter App (for the trainer) and the Viewer App (for the trainee) combines the power of mobile telephony with the ability to deliver engaging content. Corporate trainers can conduct polls to ensure trainees are able to understand the presentation, as well as keep them interested at the same time. Invite even shy participants to voice their questions through virtual Q&A. The ubiquitous ‘like’ button is also present in ShowTime so the learner can show his or her appreciation for the slide content. Create a digital profile to showcase all of your achievements.. This not only helps establish the trainer’s credibility but also increases his visibility to other potential clients. You can download the ShowTime Presenter (iOS & Android) and Viewer (iOS & Android) mobile applications . Participants can also log into attend.zoho.com to view the presentation.